Exactly 200 years ago on Dec. 24, 1814, John Quincy Adams gave Americans the best Christmas gift he could possibly give to a nation at war: a peace treaty. “I consider the day on which I signed it as the happiest of my life; because it was the day on which I had my share in restoring peace to the world,” Adams reflected. After intense negotiations in Ghent, Belgium, Adams and four other Americans signed the Treaty of Ghent, which created lasting peace between America and England. Adams led a team that included Treasury Secretary Albert Gallatin, House Speaker Henry Clay, Senator James Bayard, and diplomat Jonathan Russell. The British negotiators were Lord James Gambier, Henry Goulburn, and Williams Adams. The talks began in August 1814, only to quickly stall with no real progress. 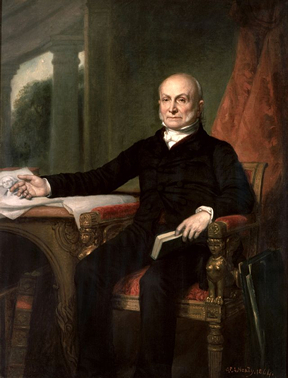 “At present I do not think that the negotiation will be of long continuance,” he confided in his wife, Louisa, who was living in St. Petersburg, Russia, where John Quincy had been serving as a high ranking diplomat. “Your fears of bad news from America in the autumn fill me with alarm, and I open all your letters with trembling, lest I should find some horrid circumstance relating to our families or friends,” she responded. That bad news took place on August 24, 1814, when the British military burned the U.S. Capitol and White House. Dispatches about the burning reached Ghent six weeks later in early October. The British negotiators, who had suggested lowering the boundary line between Canada and the United States, now had the upper hand at the peace talks. Adams was both discouraged and outraged. Louisa, too, wondered if America would survive. “The news of the destruction of Washington makes much noise here [in St. Petersburg] and they seem to think as you say that all America is destroyed. Everybody looks at me with so much sorrow and compassion that I hate to stir out,” she reflected. Many Europeans, however, considered the burning of Washington’s architectural treasures as unprecedented. “The destruction of the capitol, the President’s House, the public offices, and many private houses is contrary to all the usages of civilized nations, and is without example even in the wars that have been waged during the French Revolution,” Adams observed. Louisa soon began to notice that the burning of Washington was backfiring on the British among other European diplomats. “It is said that the destruction of our little capitol has produced such a sensation here that his little lordship [the British ambassador to Russia] has more than once been under the necessity of retiring from the soirées in which it has formed the topic of conversation,” she conveyed to her husband. Likewise, the British government hoped to gain clout at the Congress of Vienna, which was meeting at the same time in Austria to redraw Europe’s map after the Napoleonic Wars. “Should they [the British] succeed in Vienna, we shall have no peace, because they will prefer war with us, to peace upon any terms,” Adams worried. But the British lost power at the Congress of Vienna when France offered to give back the territory they had gained through Napoleon and return to their pre-war boundaries. Then came the game changer. Adams and the other American negotiators learned that Americans had successfully repelled the British military at Baltimore, Maryland, and Plattsburgh, New York. Emboldened, the American negotiators drafted a treaty that kept the boundary line between the United States and Canada as it was before the war, ante-bellum. Though this offer violated their weeks-old instructions from President Madison, they believed the risk was worth it. Adams was relieved when they received new instructions from Madison suggesting the ante-bellum terms. “In the instructions that we have now received [from Madison], dated 19 October, we are expressly authorized to make the same identical [antebellum] offer. The heaviest responsibility therefore, that of having trespassed upon our instructions, is already removed,” Adams wrote to Louisa. They arrived in safety. 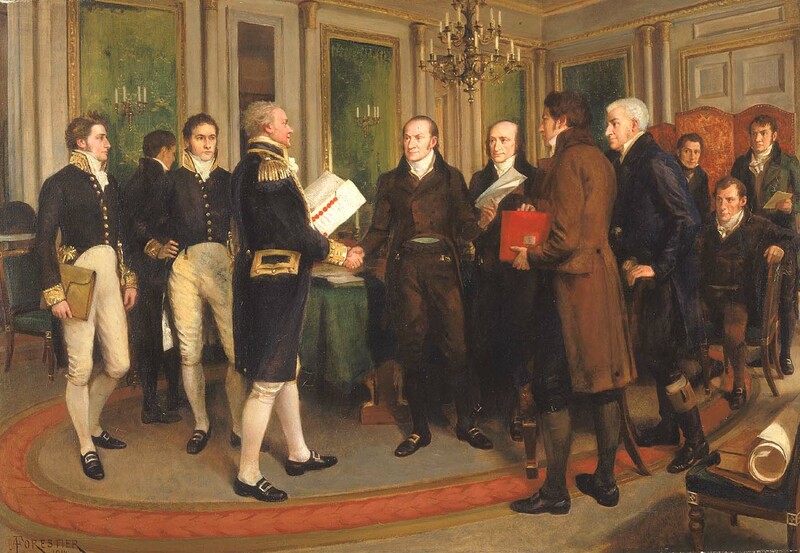 After a robust back and forth, the negotiators came to terms and signed the Treaty of Ghent on Dec. 24, 1814, a Christmas gift that has given America and Britain a lasting peace for 200 years. Jane Hampton Cook is the author of eight books, including American Phoenix, her book on John Quincy and Louisa Adams and the War of 1812. This entry was posted in Book, History, Politics and tagged Jane Hampton Cook, John Quincy Adams, Louisa Adams, Treaty of Ghent. Bookmark the permalink. Reblogged this on Jane Hampton Cook.